Greetings from the North Pole! 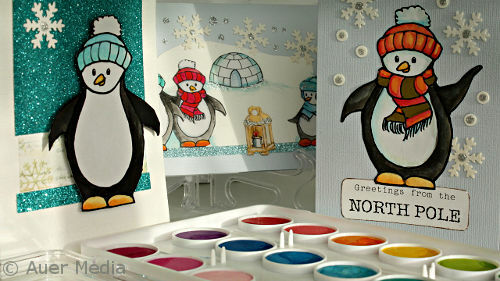 DIY Christmas cards with free printable penguins: color, fussy cut and make adorable Christmas cards. You can see all the details in a video tutorial. Print out the penguins here: Printable penguins. Use preferably A4 drawing paper - it's slightly thicker than regular printing paper. Adjust the printing size with your printer. For single penguin cards print out the sheet in A4 size, for a group of penguins print in half size. You can create cards with only one penguin as the focal point or you can arrange a group of penguins around a lantern or in front of an igloo like in these cards - or you can create your own cards and use your own favourite colors! You can create a wide variety of different holiday greetings using these chubby, little penguins dressed up in warm scarfs and winter hats. Just use your imagination! Joy to the world! New Christmas updates every week!